qaba pure blonde conditioner is formulated with certified organic avocado oil, certified organic rosehip oil and organic lavender water that nourishes, conditions and detangles the hair. qaba pure blonde conditioner protects against UV rays, heat styling tools, prevent blonds from going brassy and help with flyaway hair. Restores brilliant shine. Add qaba essential hair & scalp oils to complete the treatment and give you instant results. 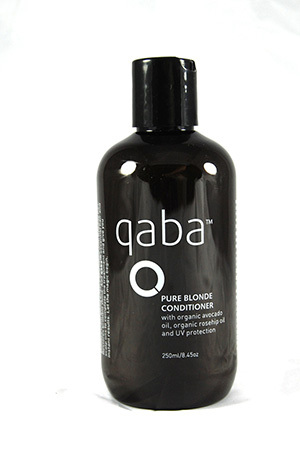 qaba pure blonde conditioner restores and maintains blondes from going brassy or gold. Normal blond hair is polished. Fine blonde hair is volumised. Dry blonde hair is pampered.